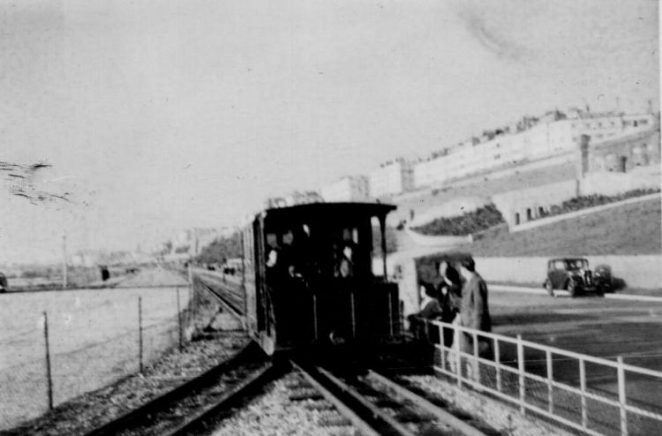 In these photographs you can just see the driver’s arm up in the air – the speed controller was located on the roof at the front of the cars until the early 1960s, when a more conventional tramcar-like controller became standard, and drivers could then relax their arms a bit! The Aquarium picture shows a signal on a pole at the end of the platform. The system was installed in the early 1950s but only lasted a few years. I can remember seeing the drivers lift a flap and operate a switch, but was never able to work out how the system worked. Does anybody have the answer? I have been driving on Volk’s Railway for a number of years, as both staff and volunteer. I for one wouldn’t have wanted to have to use the roof-mounted controllers. It must have been arm-aching. I recall it had 3rd rail for current collection although in the Black rock picture this appears to be missing on the branch or run-around. I recall the roof mounted rheostat. Can you recall the voltage on the system? 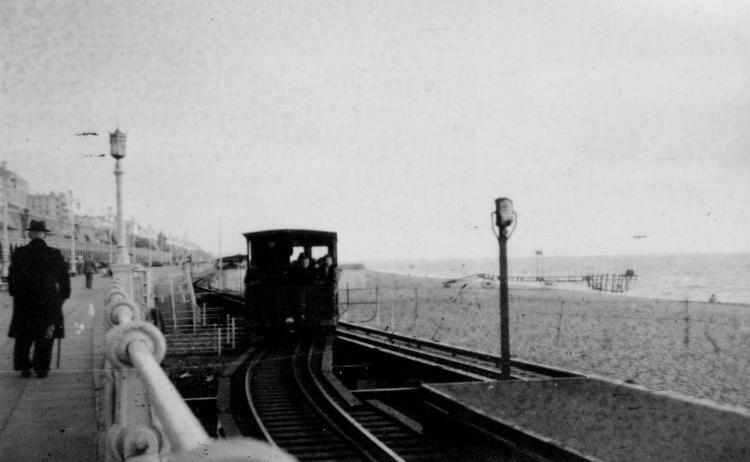 During the war, although the beach (pebbles actually) were out of bounds, Madeira Drive was open to the public. I remember being taken along the front where the Volks trams had been taken across the road and stored on sleepers under the arches. I can remember climbing on the driving platform and treading on a button protruding from the floor, where there was a loud clang of the warning gong, and I was off that platform instantly. That must have been about 1942 as I would have been 4 at the time. I also remember listening to someone walking on the pebbles, which I had never heard before. Martin, I can’t even make out the driver on either of these photos, let alone his up-stretched arm, although I think I can see a right hand on the wheel in the lower one. I wish I had your Superman vision! Regards, Alan. Not an inch to spare!